"Morbid...Moretti pulls some tricky tricks when she sends Edie on the run, where she slips in and out of some neat disguises and suffers just enough to satisfy the most judgmental reader." "Heightened language takes In Her Bones to a higher level than the standard thriller. Readers will enjoy this book for the suspense and plot twists, but love it for the skill and mastery Moretti has for her craft." "Kate Moretti is incredibly talented! In Her Bones is at once chilling and compelling, frightening and insightful—and truly madly deeply satisfying. You'll gasp at every twist, and turn these hauntingly sinister pages as fast as you can." "Kate Moretti's In Her Bones is a suspenseful, whirling spiral of mysteries within mysteries, plot twists you won't see coming, and characters linked by deadly fates that stretch across the years. Moretti's prose is crisp and masterful, her people rich and real. Don't miss this haunting, wild thrill ride." "Reading In Her Bones is like watching a true crime documentary...And you seriously won’t be able to put it down." "Sensational; a stunning psychological thriller that kept me riveted from the first page to the last. A dark and compelling exploration of what it's like to grow up with someone who just may be the worst mother in the world, Moretti's chilling and insightful novel answers the question: If your mother is a serial killer and you're obsessed with her victims, what does that make you?" "Suspense at its best: A chilling voice, an unlikely heroine, a haunting story. 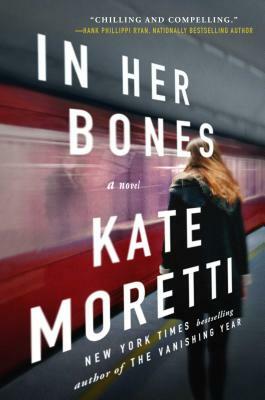 In Her Bones is Kate Moretti at the top of her game." "We dove head-first into In Her Bones, its riveting twists and turns keeping us up well past our bedtime. Moretti has meticulously crafted this gripping mystery, which begs the question: Is it possible to escape our own fate? Another stellar contribution to the suspense genre."